Genre and anti-genre, satisfaction and subversion. Why Community is so much fun for me as a geek, why TBBT isn't, and why I'm actually into that, (but you don't have to be.) I'm going to try and defend TBBT too, but defending TBBT turns out to look a lot like trashing TBBT, so something here for everyone. I don't want to generalize about Science Fiction and Fantasy, because they're very big genres with a lot of different and interesting things going on in them, but I'm going to do it a bit anyway. I think Community speaks not just to a certain classic, basic genre narrative - the band of outcasts who come together in the extraordinary place for a story of personal growth - but also to a certain genre ideology, if you will - an ideology of change and possibility. What makes a genre work for me (cue ponderous pontificating, "but what is Science Fiction?") is worldbuilding - genre stories are always consciously about places that are different, somehow, from this one. Different world, different times, different technologies, different social structures. Inherent in that, therefore, is the notion that this is interesting. That different, changed circumstances have some meaning to impart to stories about people, even if it's only that people pretty much stay the same no matter what. Greendale Community College might nominally exist on this planet, but it's hardly a real place. What it reminds me most of is one of those SFF superstructures with their own personalities, a terrific sense of place and a strange, inscrutable and yet oddly consistent internal logic. Houses or castles or space stations that are pivotal to the story and often all-encompassing of the lives of their characters. Hogwarts, Gormenghast, Babylon 5, OASIS. Greendale is a bottomless pit of weird classes, eccentric professors, strange rules, hidden corners, allies and villains and mentors and foils. It's not just in-story - the show itself is endless mutable, totally without restrictions. Community will reshape it's universe to be a mystery, a cop drama, heist movie, science fiction thriller. It can becomes animated, claymated, 8 bit, puppets - whatever the story or the characters need. It looks like a sitcom, but it's bigger on the inside. TBBT, on the other hand, has awful worldbuilding. It's a small, boring little world, one that appears sometimes to consist entirely of a couch and a staircase. Even for a multi-cam sitcom, it looks artificial, theatrical. The lights are too bright, the colors are too bright, the sets haven't changed in 7 seasons. There are few secondary characters and the episodes almost always play out in the same straightforward, traditional way. The characters all wear the same clothes all the time, like cartoons. And that obnoxious, omnipresent laughtrack! It never allows you to suspend disbelief and really enter the story. TBBT is like watching a story set in a snowglobe, somehow smaller on the inside. It's weird, but it is also oddly coherent. There's a cumulative effect there that creates something consistent, and in that way, interesting. It's not just bad worldbuilding, it's anti-worldbuilding. It's a show that simply refuses to allow the sense of discovery and adventure that most stories - particularly genre - try to deliver. I think that lack of worldbuilding is also part of something even more irritating and subversive on TBBT's part: it's largely devoid of any intellectual pleasure. One of the things genre works tend to do is to make us feel smart. Science fiction has explanations of science and technology or puzzles to solve. Fantasy requires putting together the clues and details the of the world to understand where we are and what's going on. It isn't only that genre works often have thinky stuff, they also have the solutions to the thinky stuff. A good genre story doesn't just deliver some intellectual challenge, it also gives us the opportunity to conquer it - because the explanation of the scientific concept is fun and comprehensible, because the technological puzzle is solved, because the secondary world comes together and becomes engaging and immersive. Then there are references. I admit I wouldn't quite classify recognizing references as an intellectual challenge, but it is awesomely satisfying in rather the same way. References work in putting us in a place to feel in on the joke and solidly at home with the show's syllabus, so to speak, and there's also the sheer, nerdy, slightly OCD joy of collecting them all. Community does both types of things, sometimes simultaneously. Often understanding what's going on in any given episode or scene is based on spotting, knowing and putting together the various references and allusions it throws at us, working out how it's parodying or deconstructing (or straight-playing) them, and then applying it to what's actually going on with the characters. (Not to mention just understanding the joke. It is a comedy, after all.) It's an incredibly fun sort of storytelling, and keeping up with it is immensely gratifying. TBBT is mostly devoid of this kind of thing - it has references, but it's all at face value. They're almost entirely in-world, just things the characters talk about. Instead of reaching out to the viewer and giving us the fun of recognition, the references are often didactically explained and actually made more mundane, less interesting, stripping all the delight of doing our own legwork out of it. Then there are it's frequent science monologues. One of the things I find weirdest about TBBT is it's decision to make it's cast of geeks actual scientists. Why couldn't they just have been regular geeks, really into science fiction and working in tech support or the library or something? 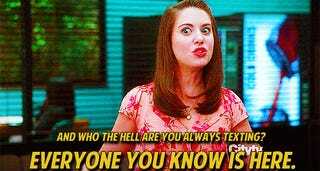 You know, like me. The thing is, I have absolutely no idea what anyone on TBBT is saying when they break out talking science. (Calculus: failed thrice. FTW.) I'm used to thinking of myself as reasonably smart (I am a geek, right? That's kind of our thing.) Wherever my sympathy in the show lies, my main identification is still always going to be the geeks - and in a comic scene that is based on clearly delineating a smart one and a dumb one, I think anyone's would be. But then the show's sciencey bits force me, like it or not, to identify with the "dumb blonde" instead. I find that momentary and inescapable twist of identification both more uncomfortable than it has any right to be - and totally fascinating. I'm not disparaging the value of feeling smart, not in the slightest. I work with kids with learning difficulties, and I spend as much time working to convince them they are capable of understanding the material as I do actually teaching it. Being confident of one's own capabilities, is an incredibly valuable tool that we carry around with us. I wish I could find a magic way to give them that feeling, rather than the nail-pulling process of navigating them past esteem-crushing reefs of failure for years on end, but I can't...because I can't turn their lives into an adventure SFF story. 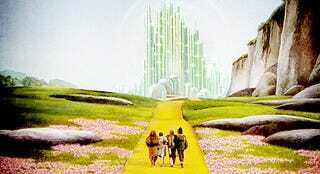 Along with the extraordinary place in SFF usually comes the extraordinary journey. Characters start out with issues of some kind - they're lonely or immature or innocent or shy, and over the c0urse of the story stuff happens to make them confront that. Adventures are had, friendships made, enemies defeated, insights achieved, challenges overcome, and flaws fixed, or even better - accepted and even loved. To Community's undying credit, it doesn't indulge much in that self-pitying Ender's Game thing about the travails of the poor outcast. There is no 'chosen one'. It's much more interested in exploring the potential of friendship than it is in whining about loneliness. It is firmly about people coming together - and growing and healing together. TBBT seems like it's setting up something similar - and then fails completely to go through with it. The story unwinds incredibly slowly. Seemingly major events manage to twist to come back around so everything stays the same. Howard gets married, only for Bernadette to turn into his mother. 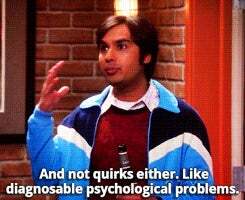 Raj learns to talk to women only to discover he can't talk to women. A trip to the north pole becomes a meticulous, fussy recreation of the place they left behind. If Community is an almost-genre work all about the possibilities of change, TBBT is like its evil counterpart. It's a story about stasis. A show obsessed with the power of habit and inertia, a show about stillness and limitation. It's people sitting on couches together, and being alone. People that have nothing stopping them from reaching out, except that it would require them to be a little braver than they are, a little more insightful, a little kinder. In short, it would require them to change, and TBBT turns that into the hardest thing in the world. On Community, change is everywhere. Greendale is a wild, ever-shifting, fantastical landscape, rife with catalysts and possibilities. All people need to do is step out and follow that path. 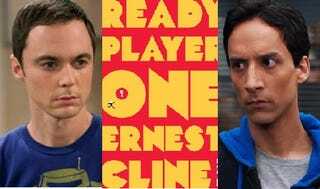 When Abed needs to deal Troy's departure, Community can become a post-apocalyptic movie to help him work through it. When Pierce's father dies, the show turns into an 8-bit game to explore it. On TBBT, change is a rare and strange commodity, one that can be mined out of the pitiful ordinariness of the human condition only with a great deal of time and effort. And yet. The rare moment of growth TBBT allows it's characters stand out with a certain hard-earned grace. Community sometimes questions the value of its own flights of fancy and delivers a harder, darker edge that undercuts what would otherwise be an insufferable sentimentality. Both shows circle around questions of engagement, immersion and obsession. I don't know about the rest of you, but I find all that rather riveting. I enjoy Community's validating exhuberance and cleverness, but I equally I enjoy TBBT's mockery, sadness and subversion. I don't think the two shows are deliberately bouncing off of each other, but they fit together in my head, and it makes both of them that much more interesting. The contrast reminds me of what it is I love about genre in the first place, but also why.